The Great Dividing Range, also known as the Eastern Highlands, is Australia's most extensive mountain range, stretching more than 3,500 kilometers (2,175 miles), roughly parallel to the continent's east and southeast coasts. From the northeastern tip of Queensland, the range runs through New South Wales into Victoria then turns westward before dropping into the central plain of the Grampians in western Victoria. 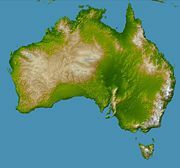 The highest areas of the Australian continent are found in the Great Dividing Range, which divides the east coast from the remainder of the less contoured and more barren inland areas. There is a wide variety of vegetation throughout its length. Rainforests provide home and shelter to a diversity of wildlife. Steep, wooded canyons fall below an elevated sandstone plateau. The snowfields of the Australian Alps complete the tableau. The Range was considered a formidable barrier to westward migration of European settlers until 1813 when a suitable route was discovered by the pioneering party of Gregory Blaxland. Following this the development of the agricultural districts of inland New South Wales began. Today New South Wales is an area of rich resources for agriculture, logging, and mining. Australia's principal rivers run through the Range. The river system provides water for irrigation for drier lands on the range's western slope, and power for hydroelectric power plants. Its great variety of mountain ranges, national parks and skiing areas provide a major tourist industry. The Great Dividing Range continues to play an important role in the development of the Australian nation. The Great Divide dominates the eastern Australia landmass. The Snowy Mountains alpine region. Domestic goats high up in the mountains of the Great Dividing Range, in East Gippsland, Victoria, Australia. Looking across everlastings on Mt. Hotham to Mt. Feathertop; during winter these mountains are blanketed in snow. Some of the most spectacular waterfalls in Australia, such as Dangar Falls at Dorrigo, New South Wales are located along the Great Dividing Range. A number of scenic railways, such as this one at Katoomba, climb various shorter routes along the range. The Great Dividing Range does not consist of a single mountain range, but of a complex of mountain ranges, plateaus, upland areas and escarpments with an ancient and complex geological history. The physiographic division name for the landmass is called the East Australian Cordillera. The crest of the range is defined by the watershed or boundary between the drainage basins of rivers which drain directly eastward into the Pacific Ocean, and those rivers which drain into the Murray-Darling River system toward the west. In the north, the rivers on the west side of the range drain toward the Gulf of Carpentaria. It should be noted that the higher and more rugged parts of the "range" do not necessarily form part of the crest of the range, but may be branches and offshoots from it. The term "Great Dividing Range" may refer specifically to the watershed crest of the range, or to the entire upland complex including all of the hills and mountains between the east coast of Australia and the central plains and lowlands. Notable ranges and other features which form part of the range complex have their own distinctive names. Parts of the highlands consisting of relatively flat and, by Australian standards, relatively well-watered land were developed for agricultural and pastoral uses. Such areas include the Atherton Tableland and Darling Downs in Queensland, and the Northern Tablelands, Southern Highlands and Southern Tablelands in New South Wales. Other parts of the highlands are too rugged for agriculture and have been used for forestry. Many parts of the highlands which were not developed are now included in a variety of National Parks. All of mainland Australia's alpine areas, including its highest mountain, Mount Kosciuszko at 2,228 meters (7,310 ft), are part of this range. 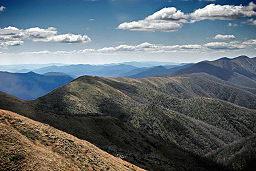 The highest areas in southern New South Wales and eastern Victoria are known as the Australian Alps. The central core of the Great Dividing Range is dotted with hundreds of peaks and is surrounded by many smaller mountain ranges or spurs, canyons, gorges, valleys and plains of regional significance. Some of the major plains include the High Plains of South-Eastern Australia, the Southern Highlands the Central highlands and Bogong High Plains of Victoria. Other tablelands considered part of the Great Dividing Range are the Atherton Tableland, Northern Tablelands, Canberra wine region and the Southern Tablelands. The Bunya Mountains, Blue Mountains, Liverpool Range, McPherson Ranges and the Moonbi Range are some of the smaller spurs and ranges that make up the greater dividing range. Other notable ranges and tablelands which form part of the Great Dividing Range include the New England Tableland, Liverpool Range, Mount Royal Range and the Monaro District. While some of the peaks of the highlands reach respectable heights of a little over 2,000 meters (6,560 ft), the age of the range and its erosion mean that most of the mountains are not very steep, and virtually all peaks can be reached without mountaineering equipment. In some areas, such as the Snowy Mountains, Victorian Alps, the Scenic Rim and the eastern escarpments of the New England region, the highlands form a significant barrier. In other areas the slopes are gentle and in places the range is barely perceptible. Well known passes on the range include Cox's Gap, Cunningham's Gap, Dead Horse Gap and Spicer's Gap. Notable towns located on the upland areas of the range include Atherton, Toowoomba, Armidale, Oberon, Goulburn, Canberra and Omeo. Many other towns and cities are located in lowland areas and foothills adjacent to the highlands. The lower reaches are used for forestry, an activity that causes much friction with conservationists. The Range is also the source of virtually all of eastern Australia's water supply, both through runoff caught in dams, and, throughout much of Queensland, through the Great Artesian Basin. The Great Dividing Range creates the drainage basins of the Australian south-east coast drainage division and the Australian north-east coast drainage division, whose water flows to the east coast and into the Pacific Ocean, Tasman Sea, and Bass Strait with the westerly Murray-Darling Basin which flow inland, away from the coast into the interior plains. Some of the rivers which flow west of the ranges includes the Condamine River, Flinders River, Hastings River Herbert River, Lachlan River, Macdonald River, Macintyre River and Namoi River. Rivers that flow east into the Pacific Ocean include the Burdekin River, Brisbane River, Richmond River, Hawkesbury River, Snowy River, Shoalhaven River and the Mary River. The ranges were originally home to Australian Aboriginal tribes. Evidence of habitation at least 14,000 years ago remains. Throughout the Blue Mountains area, traces of aboriginal camp sites, axe grinding grooves, rock engravings, other art sites and stone tools have been found. These relics have been preserved and are under protection. After European settlement in 1788, the ranges were an obstacle to exploration and settlement by the British settlers. Although not high, parts of the highlands were very rugged. In 1813, a usable route was finally discovered directly westward from Sydney across the Blue Mountains to Bathurst by the party of Gregory Blaxland. This was the beginning of the development of the agricultural districts of inland New South Wales. Easier routes to inland New South Wales were discovered toward Goulburn to the southwest, and westward from Newcastle. Subsequent explorations were made across and around the ranges by Allan Cunningham, John Oxley, Hamilton Hume, Ludwig Leichhardt and Thomas Mitchell. These explorers were mainly concerned with finding good agricultural land. By the late 1830s the most fertile rangelands adjacent to the mountains' ranges had been explored and some had been settled. These included the Gippsland and Riverina regions in the south, up to the Liverpool Plains and the Darling Downs in the north. Various road and railway routes were subsequently established through many parts of the ranges, although many areas remain remote to this day. For example, in eastern Victoria there is only one major road crossing the highlands from north to south. Rainforest along the Grand Canyon walk, Blue Mountains National Park. View from The Pinnacle in Grampians National Park. Lake Bellfield can be seen at the left. Many of Australia's highways such as the Alpine Way, Great Alpine Road, Hume Highway, Great Western Highway, Capricorn Highway, New England Highway, Oxley Highway, Warrego Highway, Waterfall Way, Thunderbolts Way and the Murray Valley Highway traverse parts of the range. Much of the range lies within a succession of national parks and other reserves including the Alpine National Park, Blue Mountains National Park, and the Grampians National Park. 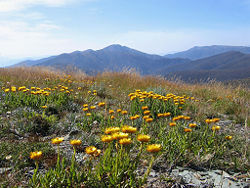 The Alpine National Park is a national park in Victoria, northeast of Melbourne. It covers much of the higher areas of the Great Dividing Range, most of Victoria's skiing, the subalpine woodland and grassland of the Bogong High Plains, and Victoria's highest point, Mount Bogong. The Blue Mountains National Park is located in New South Wales, 81 km (50 miles) west of Sydney, located in the Blue Mountains region. Despite the name 'mountains', the park is actually an uplifted plateau, dissected by a number of larger rivers. The highest point in the park is Mount Werong, while the low point is on the Nepean River as it leaves the park. The mountains received their name due to the blue tinge that they have in summer, a result of oil haze from the plentiful eucalyptus trees. 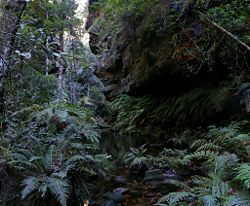 In 2000 it was included as part of the Greater Blue Mountains World Heritage Area. The Grampians National Park in Victoria is 235 km (145 miles) west of Melbourne. The Grampians feature a striking series of sandstone mountain ranges. The highest peak is Mount William. Numerous waterfalls are found in the park and are easily accessible via a well developed road network. The ranges were named by surveyor Sir Thomas Mitchell after the Grampian Mountains in his native Scotland, but are also known by the name Gariwerd, from one of the local Australian Aboriginal languages, either the Jardwadjai or Djabwurung language. The view from Pulpit Rock, Grose Valley in Blue Mountains National Park. Omeo Plains from Mount Blowhard. A panorama overlooking Blue Mountains National Park. 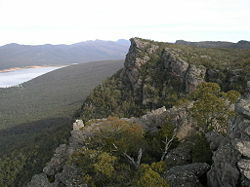 The western part of Grampians National Park. To the right is the rock formation known as The Fortress. The Great Dividing Range as seen from near Mt. Hotham, Victoria. Australian Government. Crossing the Great Dividing Range Retrieved August 22, 2008. History of "Great Dividing Range"